The MK803 is a yet another new version of Android Mini PC from the guys at Miniand, apparently based on the success of the earlier MK802 model. At the time of this writing, we are quite confused with the MK8XX family of Android Mini PC. Are they all from the same OEM place ? Do they actually share any kind of parenting lineage ? Or is it just a marketing move, to name them as successors of a particularly known Android Mini PC as it was the original MK802 ? Just in case you are wondering, at first it was the MK802. Then an MK802 II model surfaced from remote chinese waters. After that, and jumping into the bagon of the RK3066 dual core procesor, we announced the MK806 model. Now we are getting acquainted with the MK803 model, which seems to suffer from a rather odd model numbering scheme. 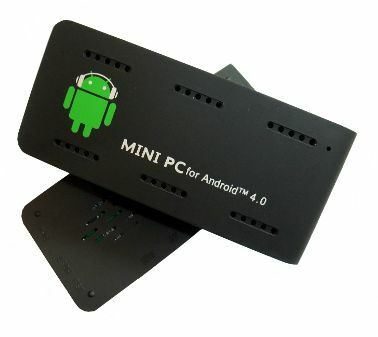 At USD 79, it seems to be on the price range for these kind of Android Mini PC, maybe a bit on the upper side of such scale. This new MK803 Android Mini PC model is based on the Amlogic AML8726-M3 Cortex A9 processor which throws some light into linux compatibility, although it cames with Android 4.0 Ice Cream Sandwich preinstalled. This by no means there is actually a Linux version for this new device, but at least there is hope (as in REAL hope). The MK803 processor runs at a nice 1.5 Ghz clock speed. The amount of ram is rather mundane, 1Gb of RAM, accompanied by 4Gb of flash storage available for storing apps and games. It also includes a microSD slot which can be used to expand the storage capacity. On the video side, the MK803 includes an HDMI output port, an USB 2.0 port. On the connectivity side, the MK803 includes a built in 802.11 B/G/N wifi adapter.